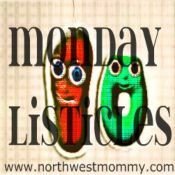 This week’s Listicles topic comes from Christine was 10 photos of life with kids, which I've slightly adjusted to 10 Photos of Bike Life with a Kid. 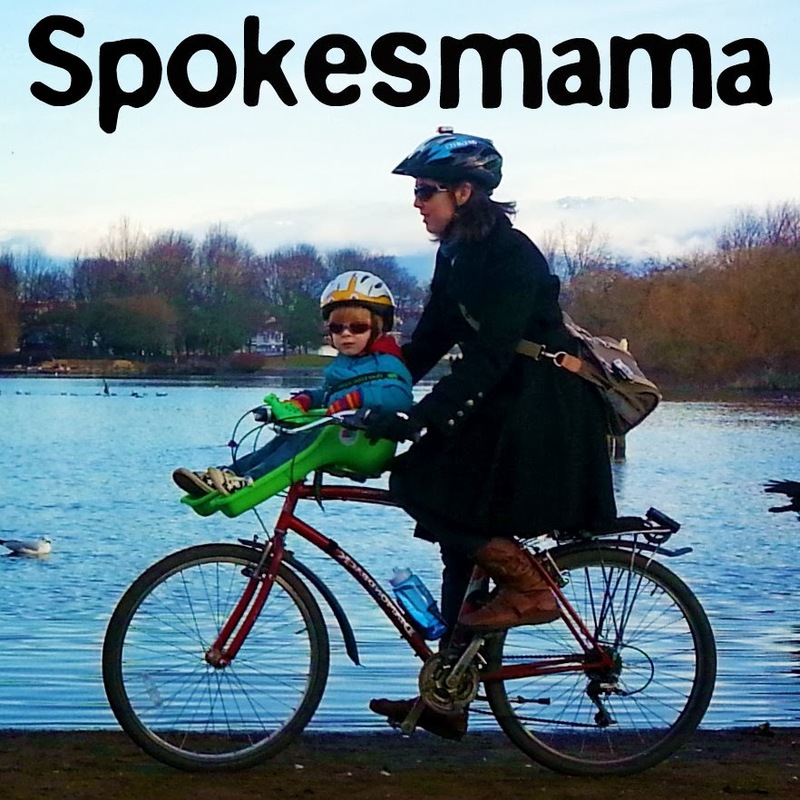 It's been a bit over two years since Sprout has been riding with us, so I thought a retrospective was in order. 1. 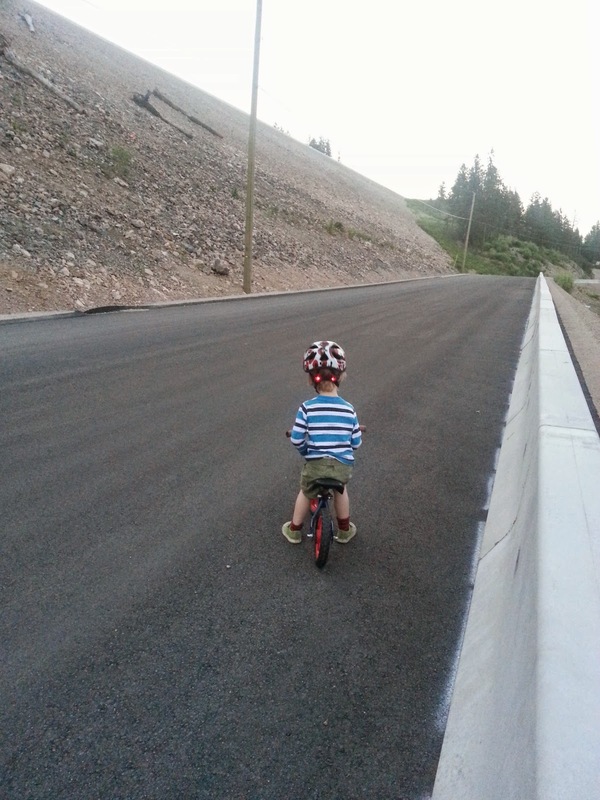 As soon as his noggin was big enough for a helmet, we started riding with Sprout. That was at about 9 months old. Yup, he's got a big head. But it's cute, no? 2. 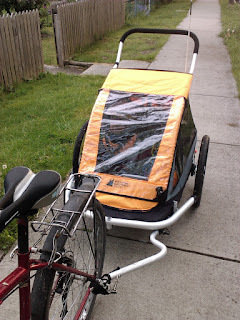 The first bike trailer we bought in the Spring of 2011. We thought a double would make sense--then we could carry one of Sprout's friends & eventually it would work for our second child too. 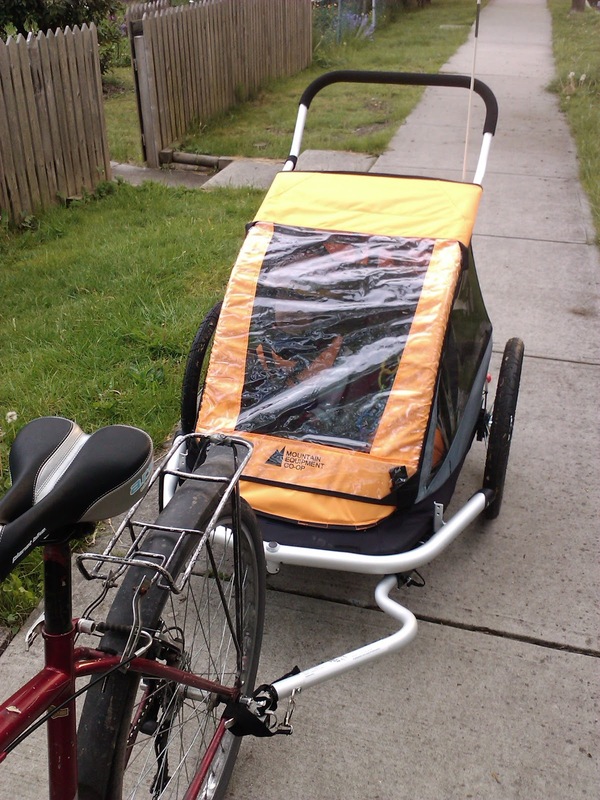 After using it a few days, we realized it wasn't going to work--when we popped the stroller wheel on the front & tried to go into a store, the thing was so wide it didn't fit through the doors of many shops we go to. So back it went to MEC (LOVE their 'Rock Solid' Guarantee--returns are so simple) & we got a single trailer. 3. 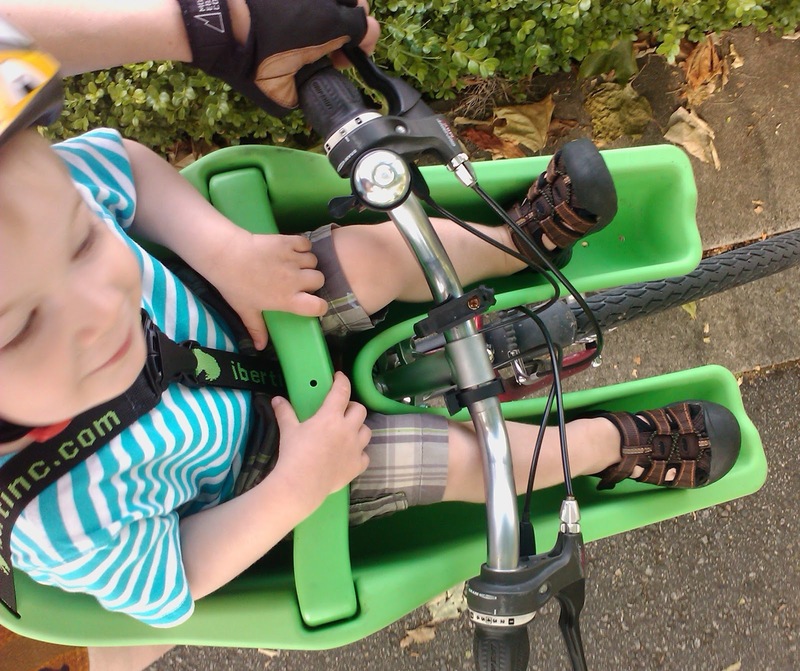 In the spring of 2012 we added an iBert seat to my bike. This is what we use 90% of the time to bike Sprout around. It's so much simpler than the trailer, unless we need to carry a lot of stuff. 4. Sprout gets his own bike! I trolled Craigslist for months until I found a great deal on an Adam's Runner Bike. I was looking for this brand specifically because it has one of the lowest standover heights & seemed to be decent quality. Sprout started riding it at 21 months, (only about three months after he started walking). 5. 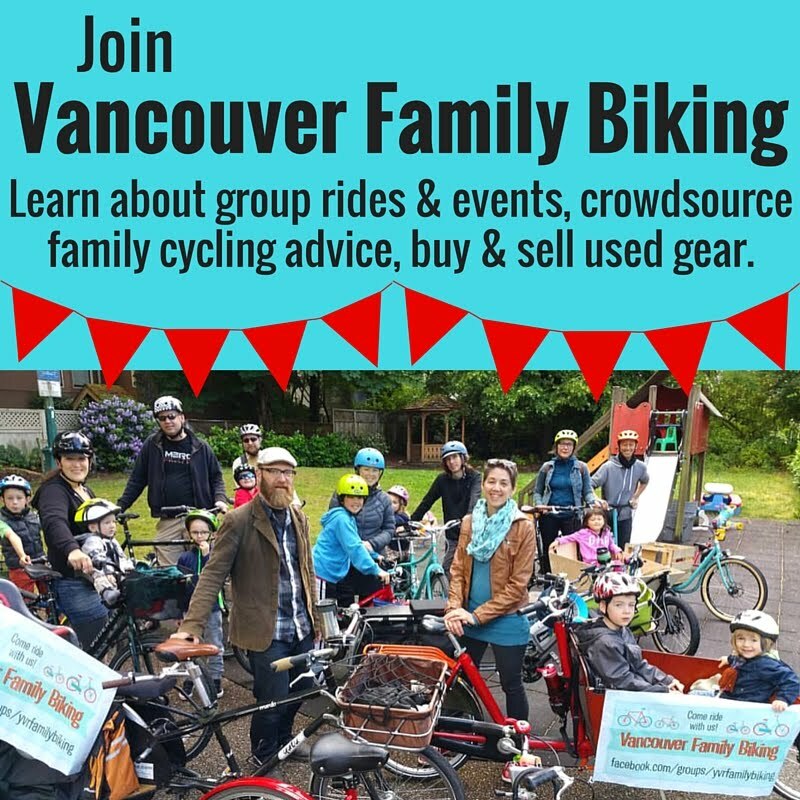 Melissa & Chris Bruntlett (you might recognize Melissa of Velo Family Diaries as one of this year's Top 30 Vancouver Mom Bloggers) organized a few family bike rides last year that we participated in. 6. 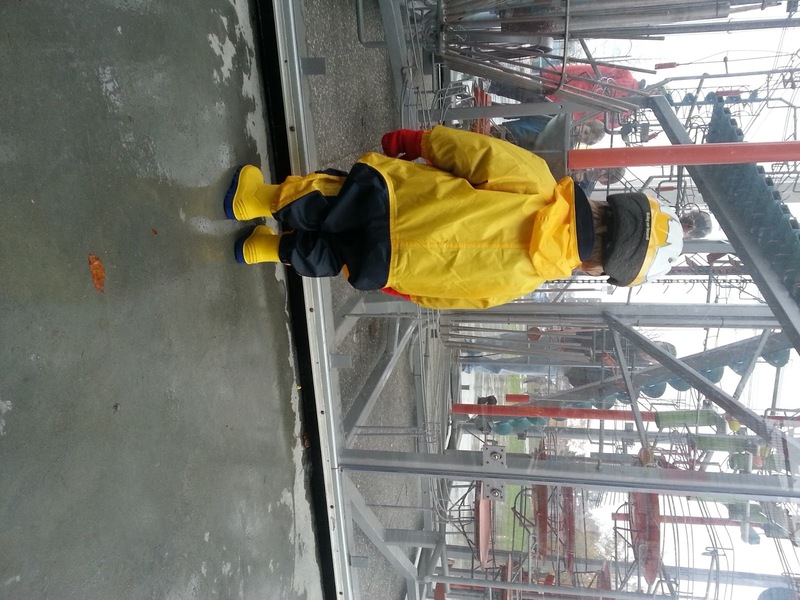 Checking out the cool mechanical sculpture outside Science World on a soggy day in Sprout's wet weather riding gear: muddy buddy, gumboots & mittens. I think this is the day we biked to the EastSide Culture Crawl--November 2012. A good example of how I never get pictures of us actually on the bike, but we biked, really we did! 7. Oli, Sprout, our friend CaroLyn, her daughter Emily & I went for a great ride along the dikes in Richmond. This little guy in the picture is 'Squeaky D' the dinosaur. I he's easily accessible to Sprout when sititng in his iBert seat. He squeaks the dino when we ride past other kids. 8. 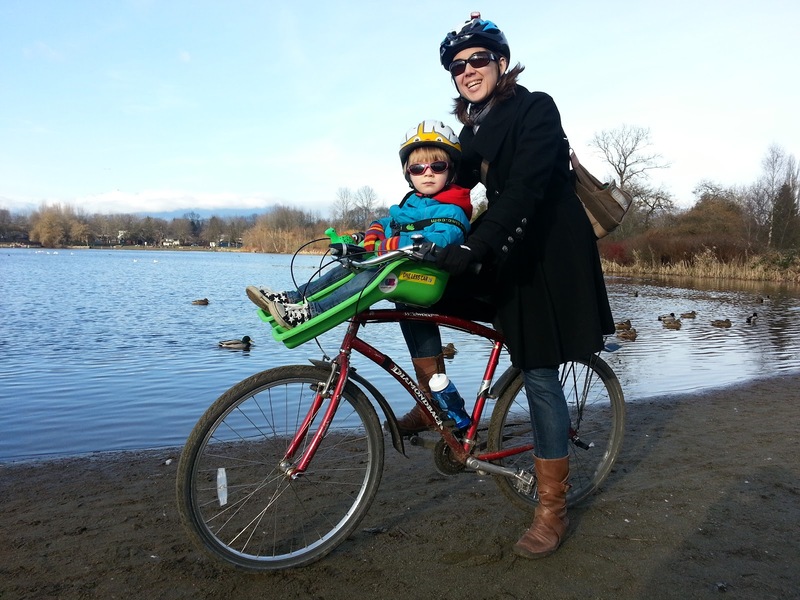 This was shot at Trout Lake in winter 2013--I really wanted pictures of me riding with Sprout--I have so few of those. Usually I'll snap a shot occasionally as we're setting off, or of him standing in front of my bike, but few action shots. 9. Perhaps unsurprisingly, our child went through a phase of being obsessed with bike racks. He'd insist on playing in them like a tiny jungle gym every time we encountered one. Which is A LOT in our city. This particular one is outside our favourite kid-friendly bakery, Sweetsalt. 10. Sprout grew out of his helmet about two years after we bought it. Due to his big round head (takes after me) it was tricky to find a really well-fitting helmet. We settled on a Giro (like mine--they just make them for our apple-shaped heads, I guess) with fancy lights on the back. Double the prices of most little kids' helmets out there at $44, but a VERY good fit, as it does not slip forward or back at all. Also: there were six different designs to choose from. He picked the ladybugs. This shot is an evening ride near his Oma & Opa's house up in the Okanagan in July this year. 11. Stopping to smell the roses. Well, watch the demolition of a house in our neighbourhood. As it's on our way to pretty much everything, we stop by & check what they're doing nearly every day. 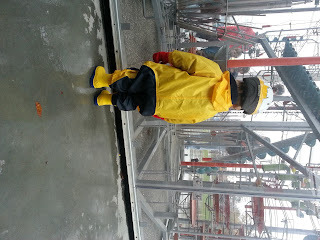 Sprout is enthralled by the excavators, dump trucks, & concrete trucks that we've seen working there in the past few weeks. 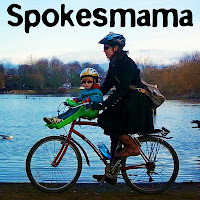 Do you bike with your kids? Have you got a favourite place to ride with them or a good bike-related story to share? I don't bike but my kids do and I walk or jog along with them. I'm one of those weird pl who never really liked riding a bike--even as a kid. love your twist on this list. That is so great that he enjoys biking with you...what a treasure. I think Dino would jump off just to scare me. Having a seat on the front makes a difference--he can see well & we can talk easily. Also, he's well-strapped in, so he can't jump off! 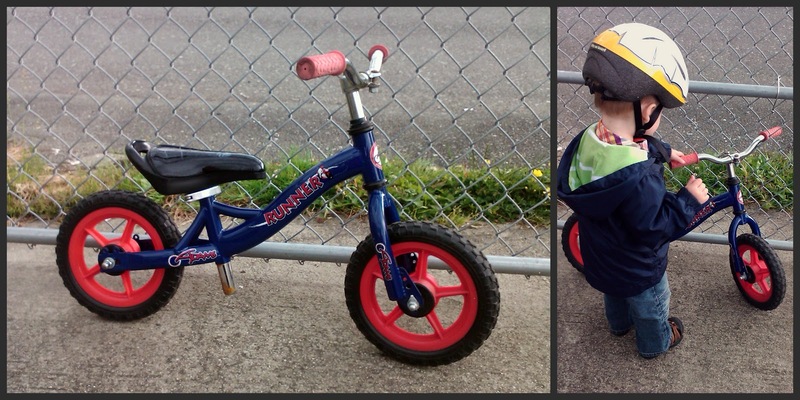 Yeah, once he's on his own bike it will be a whole new ballgame... Can't wait though--he loves the runner bike, so I think it won't be long until he's pedalling away on his own. :) Having kids 12 & 15 means you can actually go distances though--when Sprout rides, we have to stick to round trips of 2-3km or less. I did bike with my kids..well, kid. The first one. And then a bit with the second. But I could never figure out how to feel safe doing it when the third and fourth came along so I just waited until they were older. Great pictures! Hm, yeah, might be tricky with three or four... Thanks for stopping by! I don't really bike, but my kids do. I love the obsession with the bike racks! My kids all did the same thing. There must be something about them! You're right--having better gear makes a big difference. If it's more convenient & comfortable to ride with kids, you'll do it more often, right? The availability of front bike seats here is great now but it wasn't a few years ago. Despite being pretty standard in northern Europe for AGES, they're relatively new here. WHAT! That is so fun! I love the green bike seat. I certainly miss living in a town where I could bike most places. Now our neighborhood dumbs onto busy roads, no trails or paths so it is far too dangerous with little ones. Ooh, argh, don't get me started on urban planning. It's not that hard to make cities bikeable & walkable, but most in North America are designed purely for driving. & once you've built a city of cul-de-sacs & bedroom communities without sidewalks, far from any shopping/restaurants/public services, it's really hard to start biking or walking. I love those pedal-less bikes for kids - awesome that Sprout started on his when he was so young! Families who want to get on wheels with their kidkins might be interested in this post put together by an Ontario mom Ten Best: Bikes which includes a pedal-less bike, a Trekker, a trailer bike, etc. I love biking with my little fella. We have a wee ride - and as we live downtown, our favourite destination is Second Beach. I take a back pack with snacks etc and off we go! Nice! 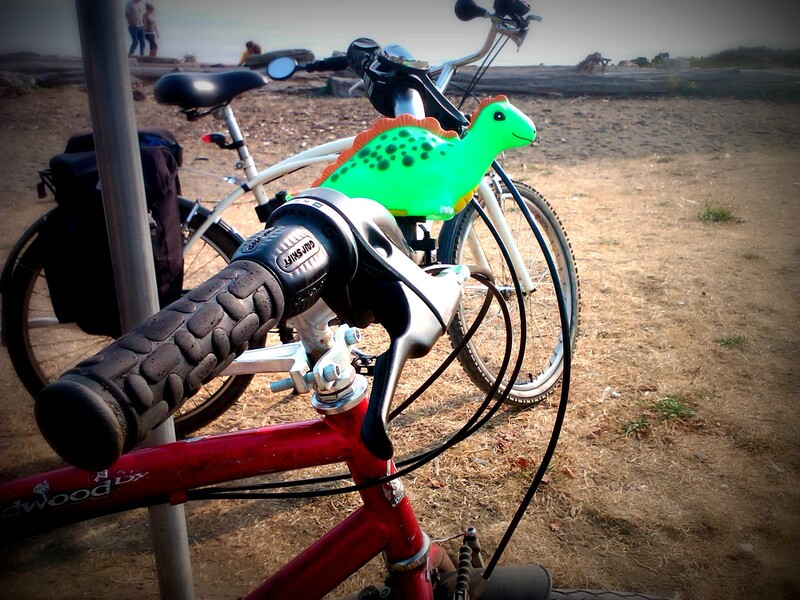 I like riding the seawall with Sprout too. I keep forgetting to try to get a (non-accidental!) shot of you riding with Sprout after swimming, especially now with your large extra passenger. :-) Maybe next time. iBert rocks. We got so much use out of ours and now our neighbor is using it! Love the rack shot. iBerts are pretty cool. Glad we got ours. :) Nice to 'see' you here, Stasha!